The compatible replacement battery pack for the APC Smart UPS 450Va Rack Mount 1U SC450RM1U is manufactured with high quality UPS Rated batteries that are designed to provide excellent performance and long service life. Our batteries are new and always fresh stock. 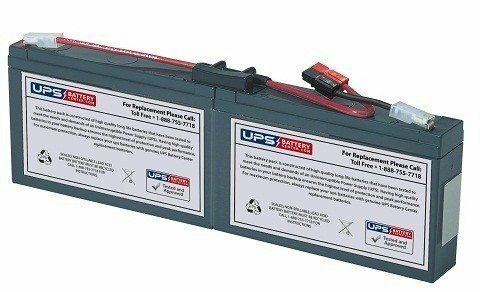 The SC450RM1U compatible replacement battery pack is covered by our industry leading 1 year replacement warranty. This battery pack meets and exceeds original manufacturer's specifications. The compatible replacement battery pack for the SC450RM1U is complete, no assembly of the battery pack required. Installation is plug and play. The battery pack arrives charged and ready for use. 100% Compatible with the SC450RM1U. APC is a registered trademark of Schneider Electric IT Corporation. UPSBatteryCenter is not affiliated with, endorsed by, or authorised by Schneider Electric IT Corporation. Arrives assembled, charged, and ready for use. Plug & Play! MEAN WELL SP-240-12 AC to DC Power Supply, Single Output, 12V, 20 Amp, 240W, 1.5"
MEAN WELL RS-75-12 AC to DC Power Supply, Single Output, 12V, 6 Amp, 72W, 1.5"